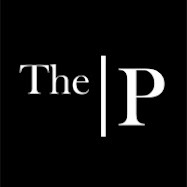 The Primitique: You could be next! Have you heard of "rugging" a house? It's the new rage. It is much cleaner than rolling or toilet papering a house. The unexpected is as shocking as hundreds of plastic flamingos in the front yard. Remember the quantity bargain rugs I got garage sale-ing Friday? Well, I decided as a joke to "rug" my sister's place. I was on the phone with her when she walked in and discovered the redecorating job I had done. Her confused voice said, "what are all these rugs?" She looked left and right and everywhere seeing a total of 27 gold and blue A rugs all over her place. I don't know who laughed more! Good, cheap entertainment. Watch out! You never know when you might get rugged! 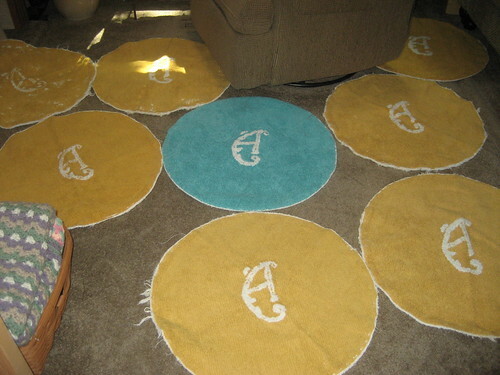 That is quite "A" rug! She should feel honored you rolled out the blue and gold carpet for her. I once decorated my sister's front lawn with huge plastic Christmas figures in July, while she was on vacation! The figures were up for about 3 days while she was gone...the neighbors told her when she got back that they knew she loved Christmas...I just love a good clean practical joke! Wish I had 27 rugs...that would be a blast! thanks for sharing your " rugging!" 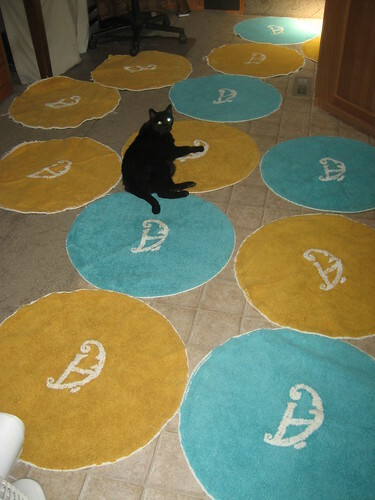 Mindy, it seems to me that only you would #1 buy 27 gold and aqua A/D rugs, but then #2 that you would actually find a perfectly logical way to use them! And I'll take that adorable black puddy cat! I'm a sucker for black kitties. Good clean fun! Love it! Clever girl! I wish I could have heard her reaction! Comeing, nay, Comming, nay, Coming Soon! Slide on in...or have a seat!